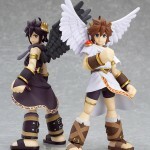 Max Factory is releasing two Figma figures from the popular Kid Icarus game for the Nintendo 3DS. They are releasing both Pit as well as a Dark Pit. Look for them to be released by the end of April. The figures are sculpted by Masaki Asai. Read on for pics of both figures.